Usually, I try not to have favorites in booze categories. Meaning, I wouldn’t say I have a favorite gin (I like too many, too well), or amaro, or vermouth. Or white wine. However, I might say I have a favorite red wine (other red wines, please turn away now). Or, at least a favorite red wine grape, that being Sagrantino. Growing only around Montefalco, in Umbria (lovely town, by the way, the Falcon’s Mount, also referred to the balcony of Umbria, and worth a visit – great churches, great museum, a few mummies, and more, and the wine, naturally), real Sagrantino di Montefalco uses 100 percent Sagrantino grapes, is aged 37 months at the shortest, and has a deep, rich, color (dark purple) and taste of dark stone fruits. Memorable stuff! But here’s something I recently found out (thanks to a bottle coming my way). There’s also a Montefalco Rosso wine. It’s a bit like Sagrantino’s more playful younger sibling. Aged just 18 months and blended with 60-80% Sangiovese. 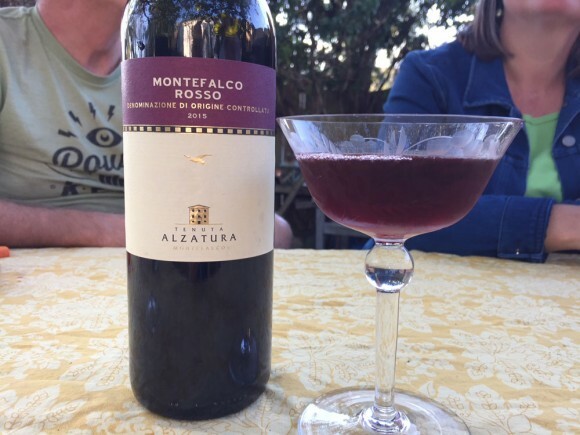 The specific bottle I tasted was Tenuta Alzatura Montefalco Rosso, which is 70% Sangiovese, 15% Sangrantino, and 15% Merlot. It’s a beautiful wine, with a light ruby coloring, and also a lighter nature than Sagrantino, probably more approachable for a larger percentage of people, with a fruity nature (red fruit, juicy ones), and hints of spice on the nose and taste, but with a softer finish than its sibling. A nice red wine for a late-summer or fall day. And also, a nice one for making into a wine cocktail. Of course, as you know, I have a hard time not experimenting with any ingredient I have at hand, and while a glass of this Montefalco Rosso by itself is dreamy, it plays well with others, too. 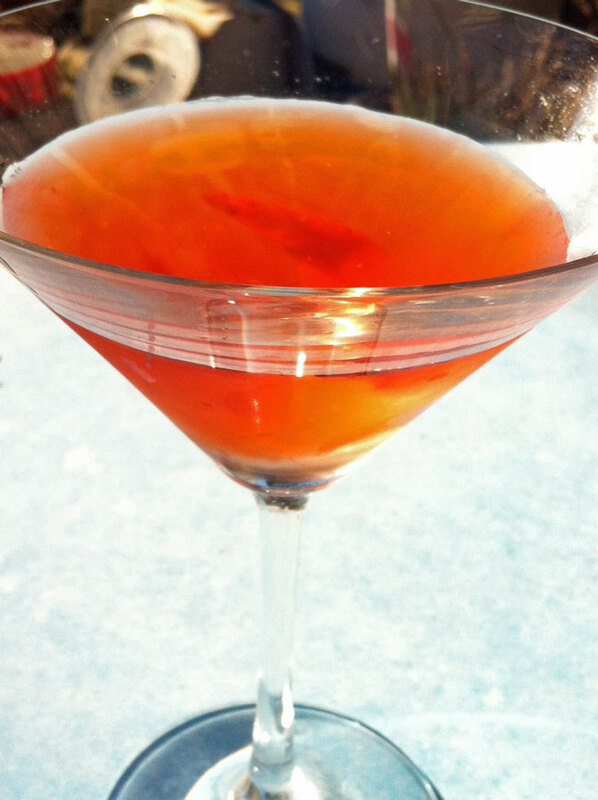 Here, I brought in some Italian favorites, starting with light, slightly citrus, aperitif, Aperol. To match up with that and to balance some of the wine’s fruits, a few dashes of Fee Brothers Orange bitters added to the party – not Italian, but we do have another Italian fav, too. See, I wanted some strong undercurrents, too (sometimes in fall there’s a chill in the air), and wanted to stay Italian-style, and so brought in an underutilized cocktail ingredient: grappa. Specifically: Marolo Grappa di Amarone, which is aged in oak, and which has cherry notes, along with an adaptable nuttiness, that go with the wine perfectly. 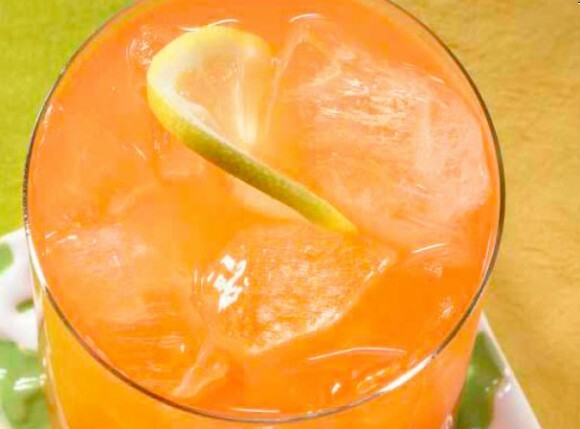 Altogether, this is a cocktail that’ll have you fantasizing of Italy – and savoring every sip. 1. Fill a cocktail shaker or mixing glass halfway full with cracked ice. Add everything. Stir well. 2. Strain into a cocktail glass. Bella, bella. It’s spring right? I mean, according the calendar and all, spring started way back on the 20th. You’re frolicking right? In a meadow? Please tell me you are frolicking. FROLICKING! It’s spring, after all, when meadows should be begging to be frolicked in, as well as various other springtime spring-y-nesses. If you haven’t started your frolicking engines, then I suggest you drink a couple Ognams. They start the spring frolicking in a perfect way. Try it out – but be sure you have your frolicking clothes on. 1. Fill a highball or comparable glass with ice cubes. Add the brandy, mango juice, and Aperol. Stir well. 2. Fill the glass almost to the top with club soda. Stir again, well. Squeeze the lemon slice over the glass and drop it in. Frolic! 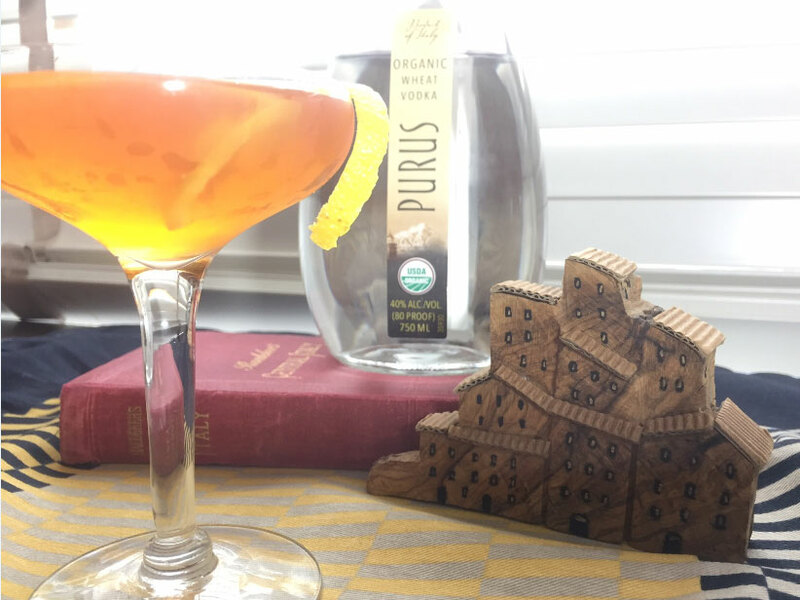 This is a globe-trotting flavorsome sipper, which actually uses ingredients from three different continents. Really! I think. Tell me if I’m wrong, but I think I’m right, though with the teutonic shifting, well, you never know what’s changed in the many years since my geography classes. What I do know is that it’s a swell mix, thanks in large part to the addition of Bundaberg ginger beer (some of which, lucky me, showed up in the mail not too long ago. Don’t hate me cause I’m lucky). 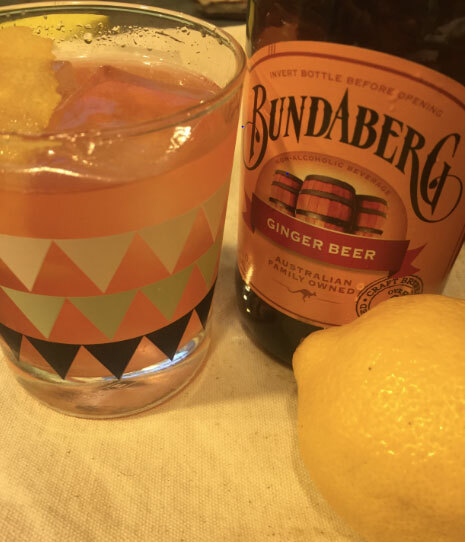 Out of Australia, Bundaberg makes a variety of tasty beverages, but is at the moment best known for its ginger beer, a n/a version made from all-natural nature-y things (roots, spices) and being a very smooth drink, with a hint of sweet and good underlying gingerness. Here, I pair it with two other flavorsome friends: Peruvian brandy Pisco, and a little Euro insertion thanks to old chum Italian aperitif Aperol. As a trio, at first glance, they may seem oddly matched, but everything brings a little this, a little that, a little of their own personality. Lots of flavor, while still being refreshing. 1. Fill a cocktail shaker or mixing glass halfway full with cracked ice. Add the pisco and the Aperol. Stir well. 2. 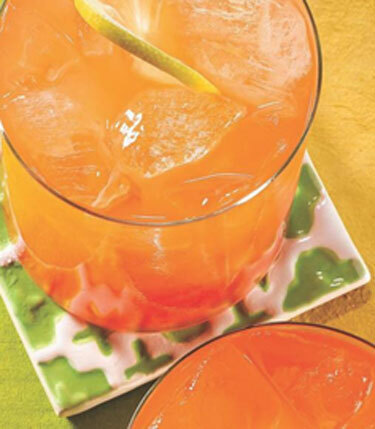 Fill a smallish highball or a good-sized Old Fashioned-y glass three-quarters up with ice cubes. Strain the mix from Step 1 into the glass. 3. Top with the Bundaberg. Stir well. I tend to shy away from pre-flavored spirits. So many, especially in my early years (but even now, for sure) are flavored chemically, with nothing natural involved, and the taste reflects this attitude. It’s a shame, but hey, them’s the breaks. However, with today’s focus on better taste, and so many smaller distilleries who’d rather serve up delicious bottled items instead of just getting out as much as possible, well, there are some good flavored numbers starting to show up. Example A: Skiprock Distiller’s Badger Pocket black peppercorn vodka. I would expect Skiprock (a distillery from Snohomish, WA) to have a good flavored vodka, since their regular potato-based vodka is awfully tasty and uses potatoes grown right here in WA. They use whole peppercorns in the Badger Pocket, and the end result is a vodka that’s spicy, but not as sharp as you might expect – there’s actually a hint of sweetness in there, too. When using it in cocktails, this gives it more flexibility than you might expect. 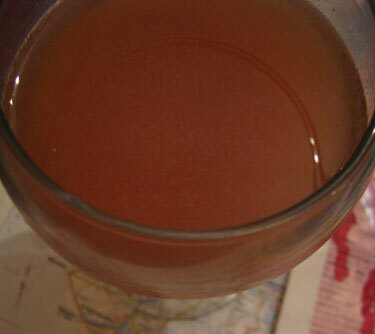 It makes a great Bloody Mary (as you’d guess), but also goes well with fruit liqueurs and a whole wide range of things. But, funny enough, when I was playing around with it, I ended up going a whole different route than originally planned, pairing it finally with the Italian aperitif Aperol (whose just-about-bitter-and-citrus-ness is a dream) and a little Scrappy’s orange bitters, ending with a drink that’d ideal when the sun is shining. 1. Fill a cocktail shaker or mixing glass halfway full with cracked ice. Add the vodka, Aperol, and bitters. Stir well. 2. Strain into a cocktail glass. Garnish with the twist. Buon giorno cocktail fans, and fans of cocktail videos, and Italian fans, and fans of good drinks, and fans of good translations, and welcome all y’all to another episode of the Cocktail to Cocktail Hour, the world’s best cocktailunmentary show. This episode is extra special, as we have a guest who’s traveled all the way from Italy to share a special recipe with us. So, watch up, and ciao until next time. 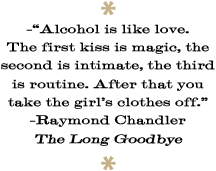 PS: Special thanks to AK Translation Services for the immaculate translating. 2. Fill the glass almost to the tippy top (Ognam insists on words like tippy top. Don’t infuriate Ognam.) with club soda. Stir again, well. Squeeze the lemon slice over the glass and drop it in. 1. Fill a cocktail shaker halfway full with ice cubes. Add the gin, juice, Viparo, and Aperol. Shake well. 2. Strain into a cocktail glass or little wine glass or flagon. Drink up. A Note: Can’t find clementine’s? You could sub in orange juice instead. Call it Highwayman’s Parole. A Second Note: You might want to strain this through a fine strainer to avoid citrus bits in teeth. But no real robber would care about that much.